The 10 year wait for the 7th film in the epic Star Wars series has come to an end. "The Force Awakens" opened this week in theaters across the world. The intergalactic saga has pulled-in generations of fans since its debut nearly 40 years ago. Its social impact is huge. Ryan Singer knows that. 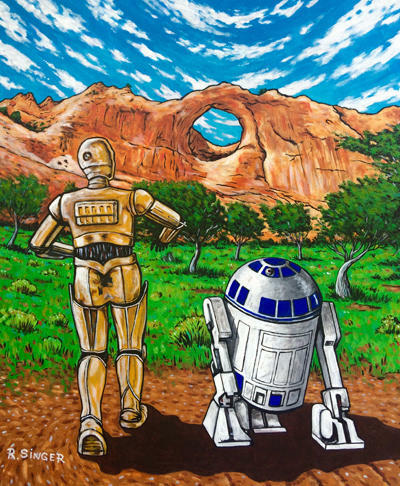 Raised on the Navajo Nation, Singer's vibrant paintings blend the landscapes and characters of both the Navajo reservation and Luke Sykwalker's home planet, Tatooine.  He told Arizona Public Radio's Gillian Ferris he's been thinking about Star Wars since the first time he saw it. GF: You were 4 or 5 when the original Star Wars came out in 1977. Can you tell the story of the first time you saw the movie? RS: Yeah. I was living in a place called Many Farms, it's just north of Chinle, Arizona. I must've been in kindergarten or pre-school. And, I'm not sure how we raised the money, but we got some money together and our parents chipped in, and we drove all the way down to Phoenix. I just remember the big cardboard displays and all the things hanging around the refreshment stand and stuff like that. So, that made a big impression on me. Then after watching the movie it really, kind of like, blew my mind away. It really resonated with that generation that I was growing up in, and everybody was really into it, you know, especially all the kids that I grew up with at that time. GF: Your artistic ambition also started very early. 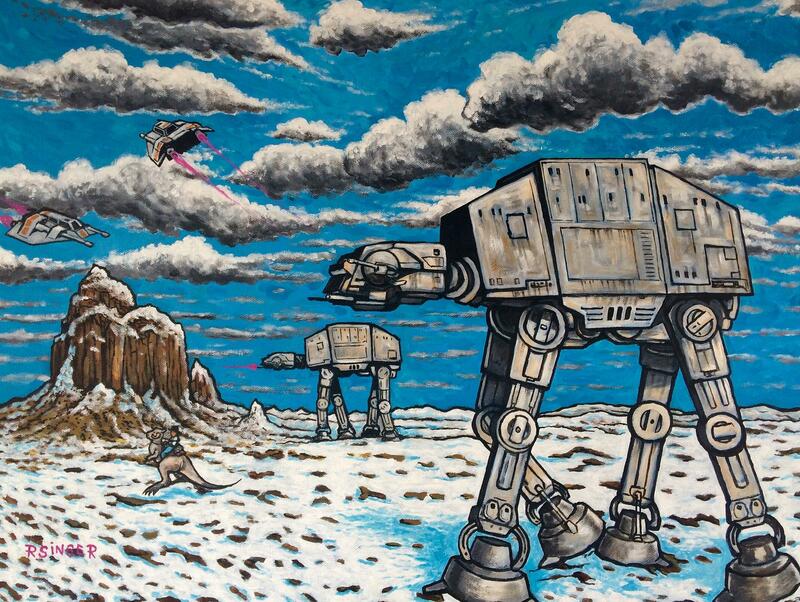 When did your love of art merge with your love of Star Wars? RS: I think it was sort of a natural kind of progression, I guess. But I always loved watching the movies. Always could relate to the movies. During my teens, I would draw sort of like comic book-surreal drawings, like black and white drawings, and I would throw in little Star Wars symbolism, or just like a little hint of Star Wars in there just to, kind of like, add the symbolism in hidden images and stuff like that. 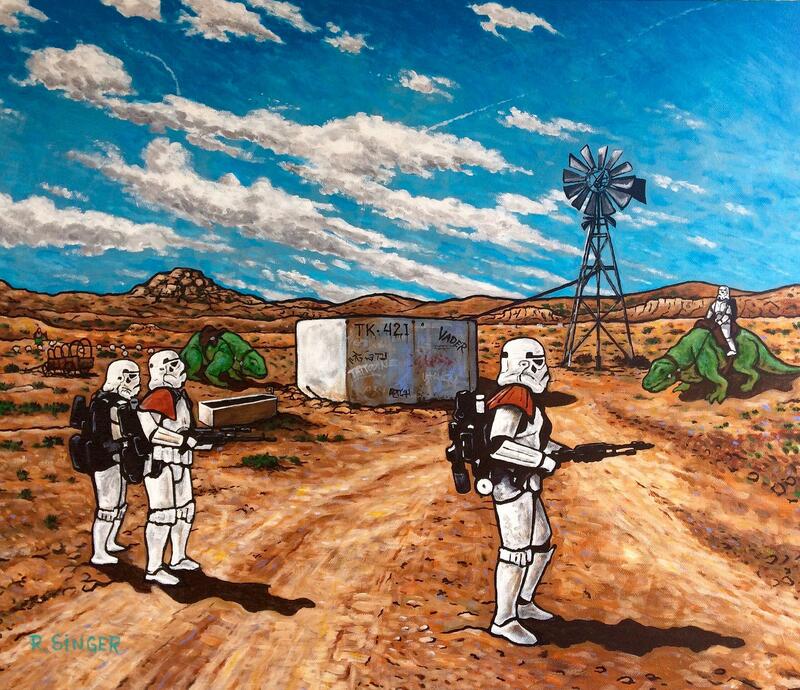 And as I got older I started to, kind of like fusing pop-culture imagery with the Navajo culture. Somehow that Star Wars just, kind of like, manifested in there. And, I always thought of Tatooine as the desert that was close to Tuba City where I grew up, and the Sand People nomadic people real similar to how the Navajos were. So, there were all these similarities I saw in the movies. There really is, like sort of , two different worlds, you know, as far as culture. I try to bring them together and mix them up. GF: Could you describe one of your paintings? 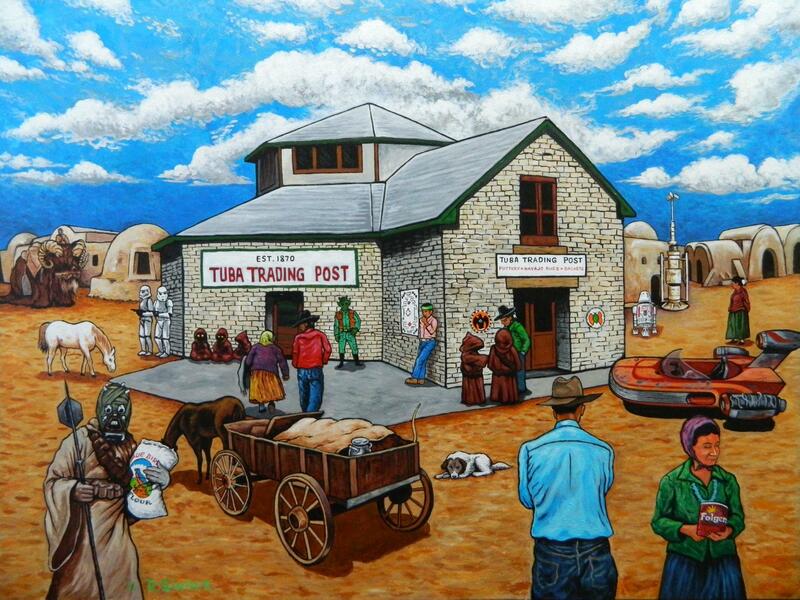 The one I'm thinking of is the one that depicts the Tuba City Trading Post. RS: The Tuba City Spaceport? Yeah, that was a painting I did a few years ago that sort of came to me with the whole idea of Tatooine and Tuba City almost being the same world or something. Similar worlds. The idea just came to me, just popped in my head and I'm like, I'm going to throw in the Tuba City Trading Post, right where I grew up, throw that in there, and throw Mos Eisley housing or dwellings around the whole place andn have them interact. 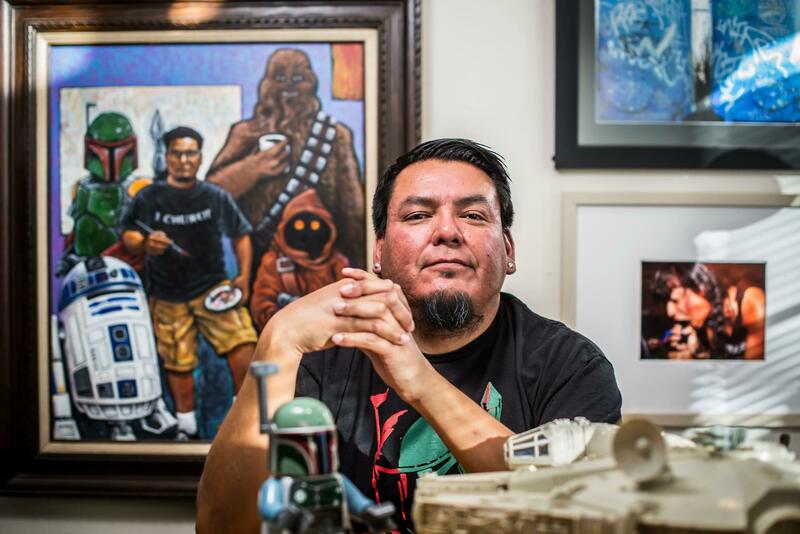 Have the Navajo people interact with the Star Wars characters. You know, like, they're trading, they're meeting there like an actual trading post, talking and doing all kinds of stuff. GF: What are people's reactions to this combination of Navajo life and culture and Star Wars life and culture? RS: They really like the idea that people are, kind of like, the same no matter what. You know what I mean? Might not be from the same place or have the same language, but there's always this ability to, sort of, get along, or they can exist - coexist - in the same place at the same time. That's what I think is cool. Ryan Singer is an artist based in Albuquerque, New Mexico. He grew up on the Navajo Nation in Many Farms, Arizona.